I was appointed to a University Lectureship in 1990, then offered promotion to the new University of Cambridge level of Senior Lecturer in October 2000 and was appointed to a personal Readership in Therapeutic and Molecular Immunology in the Department of Pathology with effect from October 2007. I was the Part II course organizer and Secretary to the Pathology Part II Tripos Teaching Committee as well as the Part II Immunology Option organizer from 1993 until 2000. Towards the end of my time as course organizer the Quality Assurance Agency carried out a Subject Review of Molecular Biosciences (which included the Pathology Part II courses), and we were awarded the maximum score of 24/24. Thus I can at least claim I didn't let my colleagues down regarding my contribution to this review! During my time as course organizer I was responsible for introducing electronic communication via Email and WWW as a standard teaching resource for the Department. I was granted a period of sabbatical leave for one year starting in October 2000 and as a result was finally able to hand on these various teaching and administrative roles at the end of the 1999/2000 academic year. From October 2003 until 2007 I was elected as President of the Cambridge University and College Union (formerly known as Cambridge Association of University Teachers) and then served as Vice-President in 2008 and 2009 ( http://www.ucu.cam.ac.uk/). In 2004 I was elected by Regent House to serve for 4 years in class (c) on the University's Council. I was then elected in a bi-election to serve in class (b) until December 2010. I was also appointed by Council (from 2005) to serve on the Council's Business Committee (until December 2008) and the University Finance Committee (2005-present). I did my first degree in Biochemistry at University College London, graduating with a (2.1) honours degree in 1978. I then joined César Milstein at the Laboratory of Molecular Biology, Cambridge and studied for a PhD on the subject of "Antibodies in Somatic Cell Hybrids". During this time I was a student of Darwin College Cambridge graduating in 1982. My next move was to join a research team headed by Herman Waldmann in the Department of Pathology, Cambridge, working on the therapeutic applications of monoclonal antibodies in bone marrow transplantation and leukaemia and lymphoma therapy (1981-1990). My research interests are in the area of immunoglobulin structure and function and I now run a home-page dedicated to this interest. For a number of years I have worked on the production of, and studies using, novel types of "Monoclonal Antibodies", a technology which celebrated it's 25th anniversary in August 2000. Several of these studies have led to the clinical use of these antibodies the best known being the humanised antibody CAMPATH-1H (alemtuzumab) .As well as the practical side of this work which involves molecular biology, tissue culture and protein chemistry, I also have access to and use computers for the visualization of the structures of the recombinant antibodies which we make in my laboratory. I have acted as a consultant on antibody engineering and on the patenting, licensing and therapeutic uses of monoclonal antibodies for a number of organizations and companies including BTG Plc and Cantab Pharmaceuticals Ltd (now merged with Xenova) and served on the Scientific Advisory Board of Biovation Ltd until their aquisition by MERCK Gmbh. A copy of my current list of publications which includes some details of UK priority patents is available. Several of these patents and associated IPR, have been licensed, or are available for licensing from the University, and if you would like to find out more about any of them please do contact me at the address details given. I hope that you have found the web pages which I have provided of some use. You are welcome to make use of the data and graphics for your studies, teaching or research but please remember that I retain copyright over the material which I have produced. I would be pleased to hear from you if you wish to make comments or have found the pages to be of interest. My main outside interests include caving, hill-walking, mountaineering and skiing (including ski-mountaineering). 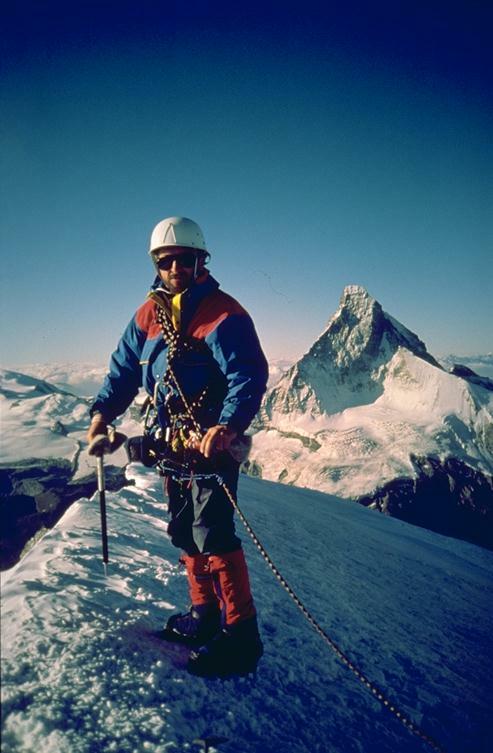 I am a member of the Cambridge Climbing and Caving Club ( CCCC ) which is BMC affiliated and in March of 1999 I became an aspirant member of the Alpine Club and was elected to full membership in 2003. I have climbed in the Peak District, Wales, the Lake District, Cornwall and Dorset. I'm also a member of the Yorkshire Subterranean Society (YSS) and have caved in Yorkshire, the Mendips, Wales and the Peak District. I have spent most summer vacations mountaineering, walking, and more recently also cycling, in the Alps. The picture at the top is of me at dawn on the summit of the Wellenkuppe (3903m), in the Swiss Alps, summer 1994. My skiing improved enough to tempt me to have a go at Alpine Ski Touring and in March 1998 I completed a traverse of the summit of the Pigne d'Arolla (3796m) with my wife Jane, two friends from the Climbing Club (Neville and Alan) and a British Mountain Guide (Martin Burrows-Smith) . In March of 1999 with the same group plus another CCCC friend, Ken Prandy, we completed a ski tour variant of the "Haute Route", from Argentierre, near Chamonix (France) to Sas Fee (Switzerland). In the spring 2000 season we traversed the Bernese Oberland and also spent some time at the Pass of the Grande St Bernard Monastery on the Swiss Italian border. Spring of 2001 saw us touring in the Vanois, and then in 2002 we toured in Italy including an ascent of the Gran Paradiso. I've now ski-toured/ski-mountaineered every year since 1998 including a second completion of an alternative Haute Route in 2009, 10 years after the first completion. If you are interested :-) you can see some more pictures of these exploits. I am also a supporter of many environmental protection groups including the RSPB (particularly with regard to the Scottish Flow Country Campaigns), The Wildfowl and Wetlands Trust, The Wildlife Trusts (for Bedfordshire, Cambridgeshire, Northamptonshire and Peterborough), The John Muir Trust, Greenpeace and the Cairgorms Campaign. One national and local issue I am concerned about is the continuing traffic problems on our roads. I am a keen cyclist and do not use my car for travel around the city preferring to cycle or walk instead. However as a cyclist I am acutely aware of the problems we face from careless and hostile drivers exacerbated by badly designed cycle routes and road junctions. I urge you to join me and support the Cambridge Cycling Campaign to help tackle these important local issues of proper traffic management in the City. Other charities and campaigning groups I support are Amnesty International, FARM Africa, The Ramblers Association, The CTC and Sustrans. The words and pictures here are © Copyright Mike Clark, Cambridge UK.